We submitted our article in December 2013, and to our best of knowledge, our study is the first study towards a general method for pathological lung segmentation from CT scans. In our experiments, we have used more than 400 CT scans covering wide range of abnormalities, and tested our computer software derived from the novel method. Our technique combines the strength of machine learning algorithms for difficult cases and Fuzzy connectedness image segmentation for initial delineation. We also consider neighboring anatomy information to find challenging pathologies within the lungs. I congratulate my postdoc Dr Mansoor for this work, and other co-authors for their valuable helps. Mansoor, Bagci, Xu, Foster, Olivier, Elinoff, Suffredini, Udupa, Mollura. IEEE Transactions on Medical Imaging, 33(12):2293-2310, 2014. 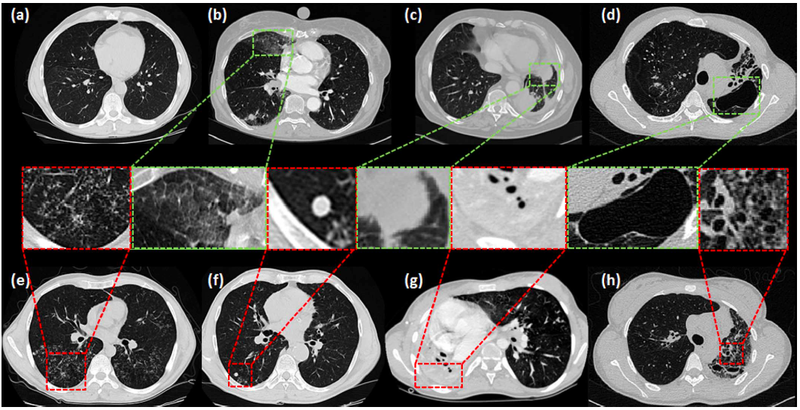 Accurate segmentation of pathological lungs from computed tomography (CT) scans remains unsolved because available methods fail to provide a reliable generic solution for a wide spectrum of lung abnormalities. In this study, we propose a novel pathological lung segmentation method that takes into account neighbor prior constraints and a novel pathology recognition system. Our proposed framework has two stages; during stage one, we adapted the fuzzy connectedness (FC) image segmentation algorithm to perform initial lung parenchyma extraction. In parallel, we estimate the lung volume using rib-cage information without explicitly delineating lungs. This rudimentary, but intelligent lung volume estimation system allows comparison of volume differences between rib cage and FC based lung volume measurements. Significant volume difference indicates the presence of pathology, which invokes the second stage of the proposed framework for the refinement of segmented lung. In stage two, texture-based features are utilized to detect abnormal imaging patterns (consolidations, ground glass, interstitial thickening, tree-in-bud, honeycombing, nodules, and micro-nodules) that might have been missed during the first stage of the algorithm. This refinement stage is further completed by a novel neighboring anatomy-guided segmentation approach to include abnormalities with weak textures, and pleura regions. We evaluated the accuracy and efficiency of the proposed method on more than 400 CT scans with the presence of a wide spectrum of abnormalities. To our best of knowledge, this is the first study to evaluate all abnormal imaging patterns in a single segmentation framework. The quantitative results show that our pathological lung segmentation method improves on current standards because of its high sensitivity and specificity and may have considerable potential to enhance the performance of routine clinical tasks. Next 4 Abstracts were accepted to be presented in RSNA 2014 !!! sorry I have missed your comment previously. Could you please send me an email on my gmail or crcv account? thanks.U.